This golden chai latte makes a subtly sweet and spicy cozy drink that tastes amazing warm or iced! Even though I live in Florida (aka – it won’t start to feel like fall until hopefully November), I’ve been craving all the cozy drinks lately – bonus if they have warm, autumnal flavors like this golden chai latte! While I’m sure part of it is mental (I’m desperate for seasons lol! ), another part of it is lately with my pregnancy I’ve not had the biggest appetite, but a warm drink or a refreshing iced beverage always sounds great! This golden chai latte is a super simple blend of a chai latte and golden milk. 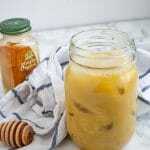 Many golden chai latte or turmeric chai latte recipes online call for making a homemade chai concentrate with black tea, whole spices, and a sweetener like honey. And while this from-scratch chai concentrate sounds delicious, in real life when I’m exhausted or short on time, I’m looking for the easiest, yet still most delicious option. 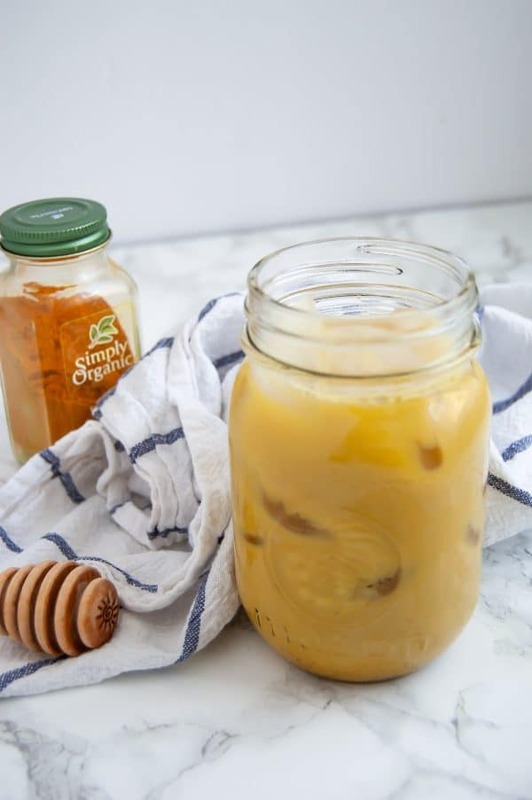 Chances are you’ve heard of chai tea before, but what about golden milk? 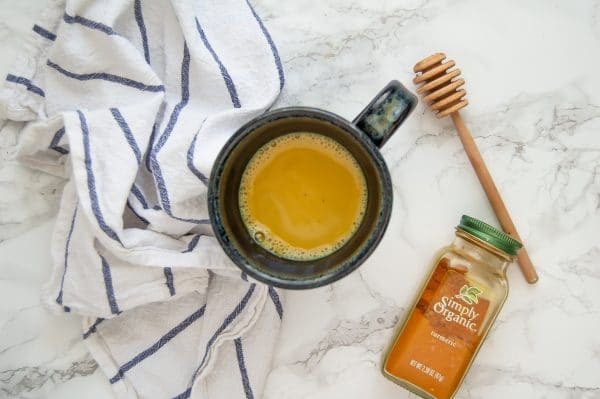 In the wellness world, golden milk and turmeric lattes have had their shining moment over the past year (in part thanks to their pretty, golden, Instagram-able appearance 😉 ). They’re a plant-based beverage (usually coconut milk) with a blend of warming spices like turmeric, peppercorns, ginger, and cinnamon beloved in the wellness world for the purported anti-inflammatory benefits of turmeric. Given the similarities in the warming spices between chai tea and golden milk, it seemed like a match made in heaven! I simplified this golden turmeric chai tea latte by using just five ingredients and making it in five minutes. Chai: choose a tea bag of chai that is caffeinated or decaf, whatever your preference. Chai often has a blend of ingredients like black tea, ginger, cinnamon, cardamom, clove, black pepper, and other potential spices (the blend will vary based on the brand of chai you select). By using a tea bag it cuts the prep for this golden chai latte significantly! Black Pepper: adds a lovely slight kick and is needed for turmeric absorption. 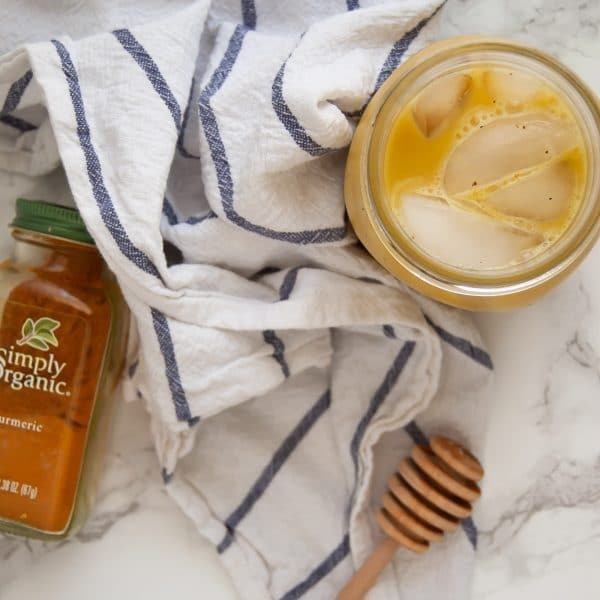 Honey: a sweetener whose flavors pair perfectly with the warm spices of chai, turmeric, and black pepper. Milk of Choice: Use whatever you have and prefer to use – almond milk, soy milk, coconut milk, oat milk, etc. If using full fat canned coconut milk I would use 1/4 cup coconut milk and an additional 1/4 cup water. Turmeric is a spice that has some compounds with medicinal properties called curcuminoids, the most potent one being curcumin. Now, I strive to always share with you guys accurate information and be 100% transparent. In this case it means I don’t totally want to contribute to the loud noise the media makes about turmeric being the most amazing superfood. Turmeric does have some anti-inflammatory and health-enhancing benefits, but it’s important to note that turmeric is only 3% curcumin by weight. Most of the studies into the positive health effects of turmeric utilize turmeric extract supplements that primarily consist of curcumin. What does this mean? This means these studies aren’t looking at the benefits you may receive from drinking 1/4 teaspoon turmeric in a golden chai latte one time. These studies are looking at impacts from large and substantial doses of the turmeric extract curcumin specifically. So yes – if you enjoy warm spices and earthy flavors like those in turmeric, certainly add it to your meals here and there. Just know that like every other food, there is not single food, spice, or herb that is the elixir to life and answer to all of your problems. If you do enjoy and consume turmeric (or curcumin supplements), it’s important to also note that curcumin isn’t easily absorbed in the bloodstream. Consuming with black pepper, which contains a substance called piperine, can aid absorption. (Many quality curcumin supplements do contain piperine as well.) Curcumin is also fat soluble, so consuming with some healthy fats can be a great way to increase absorption, too. Oh and p.s. I’m completely obsessed with having this golden chai latte over ice, too! Don’t heat the milk and when everything is combined, just pour over ice! Looking for more warm, cozy beverages? Try these! You’ve got to try my Gingerbread Chai Latte and Pomegranate Hot Chocolate! And whether you try this golden chai latte warm or iced, be sure to snap a pic and share it to social media (tag @nutritiontofit and #nutritiontofit!). Heat water in a microwave-safe container for 2 minutes. Add tea bag to the hot water and allow to steep for 2-3 minutes. While tea is steeping, heat milk of choice in the microwave for 1-2 minutes (skip heating the milk if you're making an iced latte). Whisk the steamed milk, honey, turmeric, and pepper into the steeped tea. Remove the tea bag and serve immediately! If making an iced golden chai latte, do not warm the milk and pour all combined ingredients over ice. Combine milk, water, turmeric, pepper, and honey in a small pot over medium-high heat. Bring to a gentle simmer, then remove from heat and add the chai tea bag. Allow to steep for 3 minutes. Remove tea bag and serve immediately. If making iced, allow tea to cool for several minutes before pouring over ice. Nutrition information was calculated using unsweetened soy milk; nutrition facts will vary based on each individual's milk of choice. Ive been looking for a golden milk recipe and this will be perfect for me in the evenings to wind down with! I love it! I have a frozen turmeric latte coming next week too! So delicious! Oh my gosh I just saw your frozen turmeric latte – SO smart, and so tasty!! I love a golden latte so clearly I’m gonna need a golden chai latte!! oooh yes you are, you’re going to love this!